They create life-like swimming actions in water! 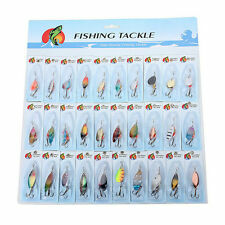 Smooth and rapid diving action Bright colors to attract big fish! 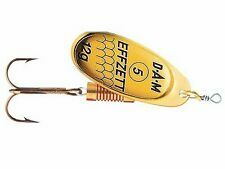 Each comes with 1 sharp treble hooks Completely New perfect design Unique movement that provokes predator to bite Instant weapon for immediately action Weever, horse mouth, Blackfish, mandarin fish and other predatory fish vision is very sensitive, especially for water and shiny things very interested in all the way will be crossed on a bite. WAR EAGLE SCREAMIN EAGLE 1/2 OZ SPINNERBAITS- Lot Of 6 - 3 Colors !! See Pics for style and colors. You will receive this exact lot of SIX SPINNERBAITS in pics. 28 X divers Spinners-Pêche-MEPPS-Taille 3/2 ETC-NEUF. 28 X Various spinners Most of them are MEPPS in unused new condition just not in blister pack there is a couple that are not MEPPS,. Please see photos for the variety of sizes and design etc. 16 of them are size 3 the other 12 are different sizes with a few size 2 mixed in . Chatterbait 14 gr, coloris pumpkin. Spinnerbait JCM Médium, 19 gr. Assemblé en France. 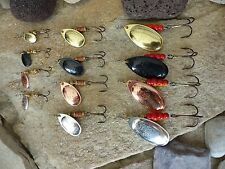 One nice job lot of 26 various spinners,plugs & lures including. Shakespeare x 2. loads of accessories,fly fishing gear,seatboxs & luggage. there's also a lot of spare treble hooks. this also includes northern/southern Ireland,highlands,isle of wight etc. Chatterbait 21 gr, coloris chartreuse. 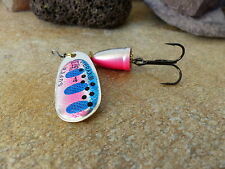 These lures have proven deadly for Bass, Cod, Mackerel. 5 x 30g NORDIC SPINNERS. NEW slim stinger 30g long casting. They have nickle trebles, split rings and strong eye at front. 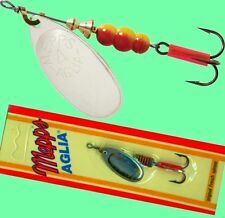 Great all round lure for river and sea fishing. Un moulinet (pratic) de son époque Pour décoration ou collection. très grande Canne en bambou, longueur 8 m, belle est propre. EN ACHETANT, VOUS ACCEPTEZ CES CONDITIONS. Etanche, rails mousse. - 12 mouches réservoir. Idéal pour le "rockfishing" et monter vos petits leurres souples pour une présentation optimisée. Type: Mini jighead. Modèle: Mini Jigköpfe. COLOR: Sexxy Shad. Cast the War Eagle Wake spinnerbait to your targeted area and retrieve just fast enough to create a "Wake" just below the surface without actually breaking the surface of the water. QuickSkirts make ordinary rubberbanded skirts obsolete. Durable silicone. Vivid long-lasting colors. John B Outdoors looks forward to serving you. What happens after I have paid for my item?. We are located in Stuart Florida. Micro King Spinnerbait Strike King 1.75Gr Spécial truites perches !!! TYPE: Umbrella Alabama Rig. Ce signal provoque l'attaque et la frénésie des perches et autres carnassiers; il n'est pas rare de prendre plusieurs poissons en un coup de ligne! TAILLE des bras: 14 et 16cm environ. 1 whip finish (finisseur de nœud). poids de l'ensemble : 670 g.
Joli lot de 9 Poppers de couleurs et tailles différentes. livré en boite à leurres d'occasion. Poids : 21g. -Longueur : 7cm. Très joli lot de 10 Poppers. livrés en boite à leurres d'occasion. Lot de 10 Poppers excellents pour le black bass. Livrés dans une boite à leurres d'occasion. 8 -> Coulant / Longueur 10 cm / Poids 10 g. 10 -> Coulant / Longueur 6 cm / Poids 10 g. 5 -> Coulant / Longueur 7 cm / Poids 10 g. Conseil d’utilisation : de part sa conception, chaque poisson nageur évolue à une certaine profondeur. 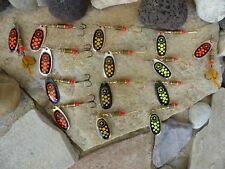 LOT OF 16 TANDEM SPINNER BAITS 3/8 & 1/2 Oz.